Chocolate Good for the Heart and Soul? Now that scientists have determined that chocolate (at least the high-in-cocoa/low-in-sugar kind) can be considered “healthy,” will researchers find anything it’s not good for? Swedish scientists now report that heart attack victims who eat chocolate regularly are likely to survive longer than their more abstemious counterparts. People who reported eating chocolate two or more times a week had a 66% lower risk of dying from cardiac causes compared with those who consumed no chocolate. Participants who ate chocolate up to once a week were 44% less likely to die. 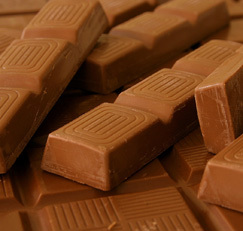 Those who consumed chocolate less than once a month were 27% less likely to die than individuals who had none at all. This study identifies an association and does not establish causality, cautions Dr. Janszky. That said, most experts believe that antioxidant flavonoids in dark chocolate protect the heart. These bioactive plant compounds might help improve circulation, control blood pressure, soothe inflammation and destroy free radical molecules in the body that damage healthy cells. Investigators found no similar benefits from eating other sweets and candies. Findings were published in the September 2009 issue of the Journal of Internal Medicine. Interestingly, milk chocolate is the kind most Swedes eat (it contains about 30% cocoa in Sweden, as opposed to 10% in the US), but in this particular study researchers did not distinguish among different types of chocolate. Previous studies on health benefits indicate that the darker the chocolate, the better it is for you. Dark chocolate (with approximately 70% cocoa) is richer in flavonoids and generally contains fewer additives (sugar, corn syrup, hydrogenated fats, caramel, marshmallow, etc.). Of course, with obesity rates on the rise worldwide, no one suggests we all go out and stock our cupboards with chocolate bars, whatever their cocoa content. But unless you have other health problems — such as diabetes — that make eating chocolate unwise, it appears that it is fine to enjoy an occasional piece of chocolate (preferably dark). An Italian study found anti-inflammatory benefits with just 0.7 ounces of dark chocolate every three days.